A few weeks ago, I travelled across Canada on our Witnesses Cross Canada Tour. There were 11 workshops over 12 days, and over 70% of attendees were brand new to the Precept Inductive Bible Study Method. I continue to be amazed at how God brings these cross-Canada tours together. Every year the tour gets bigger. This year we didn’t have any locations on the East Coast, but even with two fewer locations, we still trained almost 350 people! At each of these locations we looked at John 17 together and then broke the group into smaller groups, which gave participants an opportunity to lead through part of a 40-Minute Bible Study called How Do You Know God’s Your Father. The hour when worship of the Father will not be on a mountain or in Jerusalem. The hour when true worshippers will worship the Father in spirit and truth. The hour in which the dead will hear the voice of the Son of God. The hour when those who hear His voice will live. The hour when all who are in tombs will hear His voice. The hour that had not come when Jesus was teaching in the temple. The hour had come for the Son to glorify the Father. 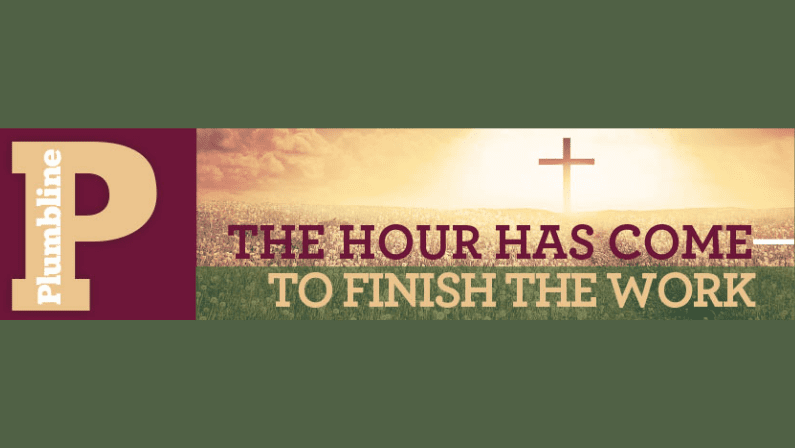 The hour had come for Jesus to accomplish the work that the Father gave Him to do. Some scholars disagree on what Jesus was referring to when He said the work He was given was finished, because the work of the cross had not yet been finished. Whether Jesus was speaking of what He had already done or whether He was already looking beyond the work of the cross when telling His Father that His work was done should not be something we are hung up on. But we should look to this statement in John 17:4 as a prayer—as a goal for our lives. This is the verse that I continued to go back to every time I taught the workshop. I asked all the groups the same question: “Wouldn’t you like to be able to pray that prayer?” “Father, my work is done, I have accomplished what you have called me to do, now bring me home.” This is Jesus’ desire for us. When we finish our work, Jesus wants us with Him: “Father I desire that they, also whom You have given Me be with Me where I am, so that they may see My glory which You have given Me for you loved Me before the foundation of the world” (17:24). Here we are more than 2000 years after the work of the cross getting ready to celebrate Easter and yet there is still work to do. Beloved, how are you doing with the work that God has given you to do? Our purpose as believers is to accomplish the work we’ve been created to do. This work was set out before the foundation of the world for such a time as this. We are called to fulfil this work here on earth and then depart, because this earth is not our home and the desire of Jesus is to have those the Father has given Him to be present with Him in heaven. Paul in Philippians tells us that our citizenship is in heaven—this is not our home. How great will it be when we can pray, “Father my work is finished—bring me home!” My heart stirs at the thought, and I’m overwhelmed not only with excitement, but a passion and desire to be accomplishing the task I’ve been given. The action is making disciples and this is the command we’ve been given—this is the work we are to be focused on. Beloved, how are you doing with this? Could you do more? Are you ready to stand before the Lord and tell Him your work has been accomplished? At this point in my life I don’t think I could stand before the Lord and tell Him, “I have accomplished all you have given me to do.” I say this because of the state of our country. My heart breaks for Canada as I see the deception caused by the enemies of the gospel. As our Cross-Canada tour concluded, many have taken up the call to make disciples by using the 40-minute How Do You Know God’s Your Father study to lead a class or another person through the study of 1 John. As we prepare for Easter, would you ask the Father how you are doing with the work you’ve been given? Would you seek the Lord, asking Him to open doors for you to disciple someone through this book as well? Paul tells Timothy, “The things which you’ve heard from me in the presence of many witnesses, entrust these to faithful men who will be able to teach others also.” This can easily be accomplished with the 40-minute Bible study resource. Or transform Easter around the dinner table by taking the time to dig into God’s Word with a 40-Minute study Jesus: Understanding His Death, Burial, and Resurrection. These practical Bible study tools are available on our online store or by calling the ministry. Blessings to each of you this Easter. I’m praying that God will move in your heart, and use you to make an impact for the Kingdom of God in Canada.